Misleading advertisment by Proton Edar? This was one of the most misleading advertisements of all times. Yours truly was alerted by a reader and yours truly did check with the marketing arm of Proton, Proton Edar. It was true that the above promotion was restricted to cars manufactured by Proton in 2012 and only specific models for cars manufactured in 2013. When asked what are the models for this promotion, the officer from Proton Edar Call Center said she cannot revel and asked to go to Proton Edar Showroom for information. Even an ads is shrouded with secrecy! What is happening in proton? 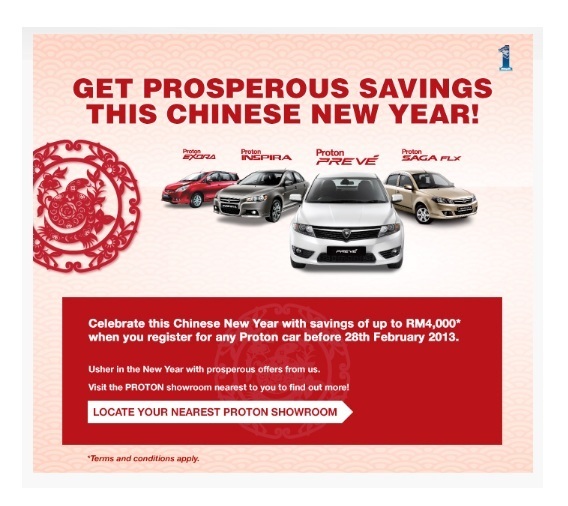 If one were to examine the above advertisement, the said Chinese New Year promotion is for “ANY PROTON CAR” and the picture shown are for models Proton Exora, Proton Inspira, Proton Preve and Proton Saga FLX. Please see similar posting in HERE. Potential Proton Edar customers should lodge a complaint with the Ministry of Domestic Trade and Consumer Affairs for this misleading advertisement. Previous Azahari Dahlan: Was SRT’s statement referring to a possible joint venture with MAS? Next Datuk Bandar KL: Which GLOBAL-ly known company was awarded the new ITIS Project? Quite rightly put, this was one of the misleading ads of all times. The ads clearly stated that any Proton car. When called upon to check then the restrictions come into play. This is a clear case of misleading ads which Ministry of Domestic should take action under the new regulation on Misleading Ads. Like any other advertisers, they always believe that the small print “terms and conditions apply” will cover themselves of any hidden agendas. Perhaps YB being a lawyer can highlight us all from the legal points of view. Needless to say, I think the ministry as usual will not do anything despite the new regulation being effected from January 1st 2013. Otherwise Air Asia would have not rampantly keep on selling their tickets beyond the validity of their AOC. The rakyat will always be taken for rides by these conglomerates. My ever confidence in the government is really fading by the day.. Hope they will do something fast..
Do yourself a huge favour , DONT buy a proton. Poor quality at a premium price ! The word is ‘up to RM4,000’. Only the Inspira is at the maximum of RM4,000.00 while the others are much less. Hope you are great with your happy life. I was reading about your political performance & actions. I feel you have your own mind set to do something for peoples of Malaysia that they will remember you for long time. I live at Jalan Genting Kelang, Setapak( K.L ) since 5years. If we compare to 2008 now the population of this area is around double. Mostly students in this area & around danau kota there are families & working peoples. According to population development law, this area got not any development even population is double than before. 1- In one year more than 20 road accident, injuries, deaths while crossing the road. There is available over head bridge for road crossing but TWO reasons why peoples not use it. b- night time snatchers & gangster stand there. 2- In this area almost all pedestal path are broken, If any shop owner fix path he use is for their display units. 3- Motor bike riders start from evening. Kindly take an immediately action to order a traffic light for a walking peoples who can cross the road in front of Public bank. I will be appreciate you. As a matter of facts, the overhead pedestrians crossings for Jalan genting Kelang were in the original plans for the widening of road project but for some reason DBKL officers have abandoned it. I have been pushing DBKL to build several pedestrian crossing along jalan Genting Kelang. DBKL has recently agreed to build them but in a few months. However, I am still pushing DBKL to build them as soon as possible in order to avoid accidents as stated by you. Please call my PA En Yacob at 0122186929 or 41433322 so that he can provide you with all the correspondence for your records. Thank you for your comments and I now have more basis to insist that the said bridges be built in the immediate future. Gong Xi Fa Cai to you and family too. I also hope that Proton Group would explain why was the ads different did not state that the RM4,000 discount was for certain models only. Was this ads just a gimmick to get customers to go the Proton showroom? Perhaps the Ministry of Domestic Trades and Consumer Affairs should also step in examine this ads to see whether it was misleading. AirAsia is still coming out with its misleading adverts selling tickets way beyong its AOC’s validity and no news on actions taken by Domestic Trades and Consumer Affairs Ministry. Are these regulations/acts are just for show only? Appreciate your comments. Last but not least GONG XI FA CAI..
We had to officially write to the Minister demanding for action under the new regulations on false advertisement. I will also inform the Ministry about it. I hope that you all do the same. Hi.. I went to 4 dealers and they offer me different discount rates, ranging from 2k to 5k.. so I think the ad itself is very very subjective.. it all depends on the dealer themselves.. Some are willing to earn less to boost their sales and some won’t let it go. . Just my personal opinion.. same goes to the 5 year warranty coverage. . Any info about the parts covered? Btw, the model I’m aiming is Preve Cfe..
Hi…just bck from showroom..wanna to book preve or xora..salesmen tell me that for preve are disount untill 7k..but for model 2012 end..for xora cfe standard..model 2013..no any rebate…soooo sad…adv do not said like that…but what wanna do…buy ja…hope can get the discount…yb..did any respon from proton.. So far no respond from Proton. I don’t there will be any respond from them unless the rakyat stop buying the cars fro a few weeks. Then they will wake up. Worst still, AirAsia is selling tickets beyond their AOC validity and the Ministry of Domestic Trade and Consumer Affairs / Ministry of Transport / DCA are doing nothing about it. Something very fishy is going on..
And YB WCK has promised to report to the Ministry concerned. Have you YB? I had. I have brought this matter to the attention of the Minister and he has instructed his officer to look into the complaints. I will bring to his attention with regards to complaints by readers to his attention again. And yet the arrogant thick skin AirAsia never want to emulate Proton. Perhaps not until Malindo Airways starts its operation..
how can they call this CNY promotion? they have been offering it since late last year.